I just love this pattern from Phydeaux Designs. You can click through the before mentioned link to take you directly to the pattern source. 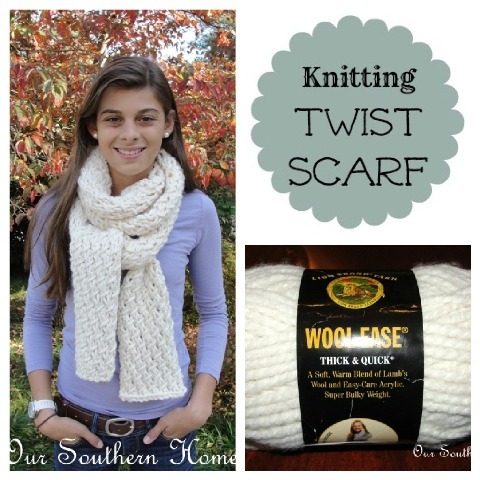 It is a purchased pattern, but inexpensive instant download. I stay very busy with my family life, decorating our home and blogging. I need my knitting projects to be somewhat simple and quick. It would be very boring to just do the same old garter stitch pattern all of the time. I want my efforts to be pretty and stylish….on the fast and easy! I find that I keep going back to Phydeaux Designs! You will need: Phydeaux Designs pattern, 129 yards of super bulky yarn ( I used 2 skeins of Lion Brand Wool-Ease Thick and Quick), size 19 US knitting needles and materials of your choice for blocking. I purchased this item for blocking last year when I needed it for a cowl pattern. I love it! I purchased it from the Lion Brand website. It has interchangeable blocks to adjust for project size. It comes in this awesome storage bag with directions and upholstery pins. Please note that this is on the pool table cover! Lol!!! Not a tablecloth! I just realized how cheesy it looks. This pattern is great for the beginner knitter as long as you feel comfortable with your basic stitches of knits and purls. This is the first time that I tried this pattern and loved the variation it provided. I love Lion Brand Thick and Quick yarn. I used it here in the colorway of Fisherman. I needed 2 skeins, but did not use all of it. I think I'll go purchase another skein to do a hat! Do you know how it looks like it is curling into itself? Some patterns do this. It is OK. You simply have to block it. I know….I was scared of this at first, but it is super easy peasy! My scarf ended up 108 inches. You could really make it as long or as short as you like as long as you finish a complete pattern repeat. I like the double wrap look with this one and having more options for a chunkier look with the extra length. It is a simple 4 row pattern when combinations of knits and purls. The variation was new to me, but there are very detailed instructions to explain how to do the combination. I figured it out and quickly memorized the repeat so I didn't have to keep looking at the instructions. Blocking: There are many methods online for this. You don't even have to have a kit like mine. Some tell you to do it with an ironing board, on towels or directly onto the carpet. I just bought the kit! I simply wet the scarf in the sink with cold water slightly squeezing out the excess. Then lay it wrong side up on the mat and pin it to the board as you go. Since the scarf is slightly wet, you can stretch it out to the width and length that you like. Let it dry completely. I left mine on the floor for 2 days. Remove pins and you are ready to enjoy. Mine still curls a bit, but it's OK! I completed this scarf while in college football traffic and a couple of evenings while watching television. I find that needles and yarn in my hands are the only way I can stay awake these days!! Here is the completed scarf wrapped around my 13 year old daughter's neck once with the sides hanging long. Here it is wrapped twice around the neck. She began to treat this as a Vogue Knitting photo shoot! LOL!! Close up of the stitch detail….notice the twists! Just a combo of knits and purls. The “I've watched too much Project Runway” look with my mom! I love it like this! Luckily we can share accessories! At 5'8″ she is way taller than me (and thinner!!). Probably no hope of ever sharing clothes or shoes! Won't embarrass her by sharing shoe size! Now acting silly with that pucker face everyone is doing! Yay! It's over and I can do what I love best……still acting like a silly kid! Don't expect many posts with my teen son…..he thinks this blog thing is way lame! I hope you try this pattern! Let me know if you do! I'd love to see your pictures and colorway that you pick! Thanks for stopping by! I'd love for you to join my blog and follow along. Options are in the right side bar. I love this scarf. It looks so thick and soft and comfy! I don’t knit but my daughter started this summer so maybe I can talk her into making one of these when she’s home on break. . . ? A mom can wish. I don’t think she knows what blocking is yet so that’ll be something we’ll figure out together. Super cute model! Beautiful scarf. My daughter is teaching herself too. Thanks, Ann!!! I hope she loves it as much as I do!! You Tube will be her friend! Just following you. My Mom knits. I am taking knitting needles at Thanksgivning and going to take a lesson or two. I saw a Martha Stewart pattern to use. Wish me luck. Thanks, Lori!! So nice to meet you! That is great. 🙂 I taught myself to knit so you will do great with your mom teaching you. What a fun time you’ll have! I’d start with a simple garter stitch scarf…knit every row with a chunkier yarn and maybe size 15 needle, but your mom will be able to guide you along. Don’t expect perfect at first…embrace mistakes or you’ll be frustrated. I can’t wait to hear your progress. Beautiful scarf Christy and such a beautiful model! Thanks so much!!! I really appreciate you stopping by!! Have a beautiful day!